Black, silent laptop. Another new office notebook in the hotly contested price segment around 400 Euros (~$555). 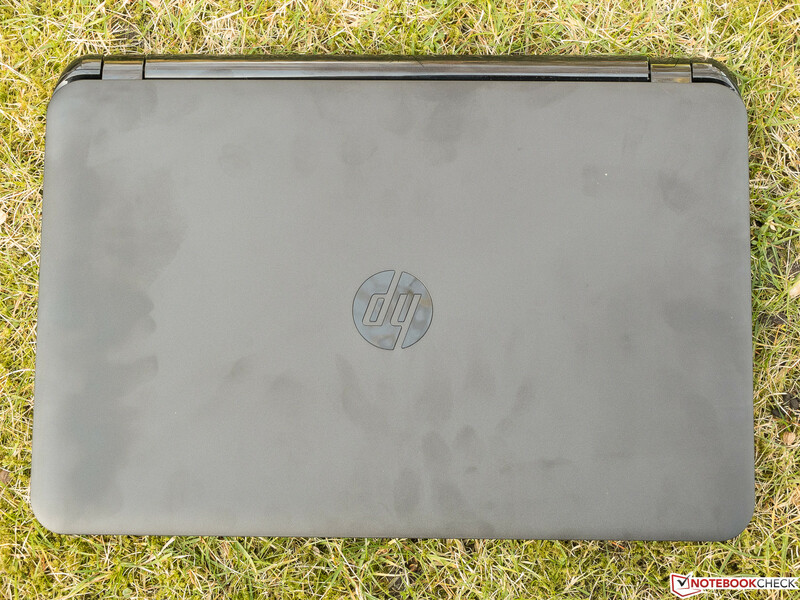 Did HP manage to break the monotony and give its entry-level model a special touch or did we have to deal with the usual standard fare? 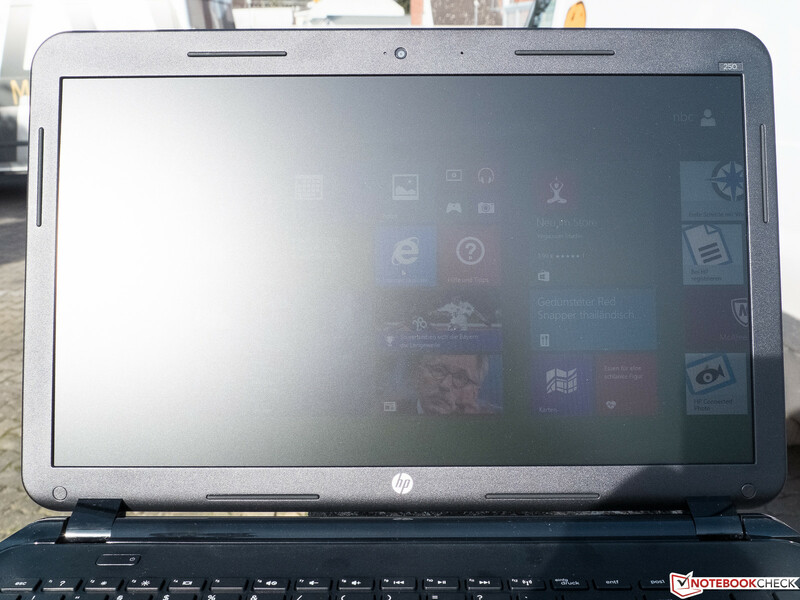 Does the price tell all or can the HP 250 G2 surprise us in a positive way? 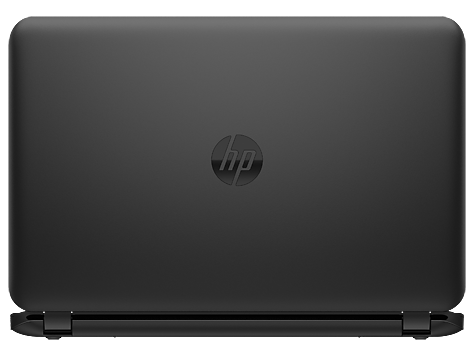 HP positions its new series 250 G2 in the lowest price segment, a high-volume market suffering from low margins with many competitors in 15.6-inch format. The Intel Pentium N3510 CPU (4x 2.0 GHz, no Hyperthreading, no Turbo, TDP 7.5 Watts) tells that the notebook has been designed for office scenarios. The integrated GPU supports hardware-based decoding of videos, which makes a smooth playback possible in the native resolution of 1366x768 pixels. With the DVD burner, the manufacturer emphasizes light multimedia capabilities. The Acer Aspire E1-522-45004G50Mnkk of the Aspire E1-522 series, which consist of many models, is one of many competitors. It is very similar to our test model in terms of case and connectivity, but comes with the competing Kabini platform from AMD. At 15 Watts, the A4-5000 (4x 1.5 GHz, no Turbo) CPU has double the TDP of the especially frugal Pentium in our test model, but it also delivers a significantly higher graphics performance yet without even slightly pointing towards gaming. The fairly elegant case is completely made from black plastic with mostly matte surfaces. Only the sides and the area near the hinges have a piano finish. 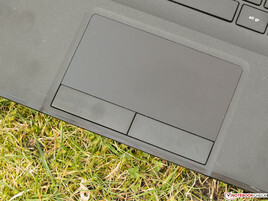 The keyboard bed and upper side of the base unit are textured and do not attract fingerprints. This is not true for the velvety looking lid. The base unit warps quite easily from side-to-side twisting. The lid, which can only be opened by holding the base unit, teeters markedly. 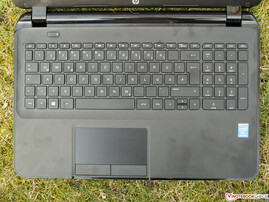 The HP features the usual connectivity that can be expected for the low price. At least all ports are standard size. The positioning of the ports near the front of the sides is unfavorabe since connected cables and USB sticks can interfere with using an external mouse. The Wi-Fi performance was normal in the test setup of the author. The maintenance hatch only allows accessing the single RAM slot, but you will not reach hard drive or fan. We feel, the design is simple, yet attractive. The keyboard has a number block, no keyboard light and mostly a standard layout. So, the user will not need long to get used to it. In our opinion, only the Ctrl and the Shift key on the bottom right are too small. Several keys, i.e. Caps Lock, Wi-Fi, and Mute, have indicator LEDs. The travel of the flat and slightly rough keys is low, but the pressure point is clearly noticeable. As the stroke is very close to the pressure point, it feels slightly hard and might promote fatigue. Typing creates a rattling noise. The keyboard bed gives in easily with little pressure. 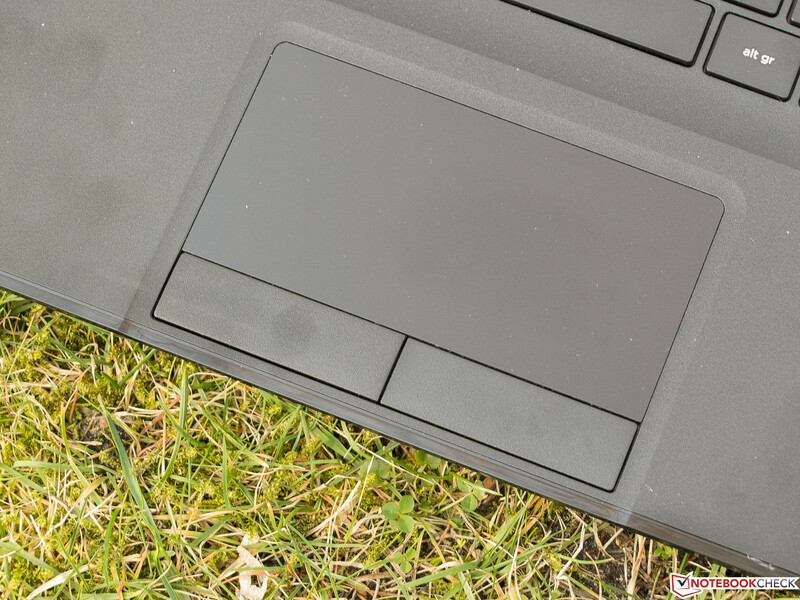 The Synaptics Touchpad V7.5, which could have been bigger, recognized gestures with up to three fingers nearly always reliably. The slightly textured surface gives a pleasant tactile feedback. This is also true for the mechanically recessed keys, which feature a well-balanced resistance according to the tester. Matte or not: you can't read from the screen with the sun from behind. In this price range, even 15.6-inch laptops rarely feature bigger resolutions than the 1366x768 pixels (16:9) of our test model. As a result, the pixel density is low with 100 ppi. Therefore, the naked eye can see single pixels, fonts are not perfectly sharp and there is not too much space for icons and control elements. While the maximum brightness of 228 cd/m² (center of the screen, also available on battery) is not perfect, it is all right for this price class. At least, combined with its matte surface, the minimum ergonomic requirements are met. Otherwise, the cheap TN panel is unimpressive with dull colors, narrow viewing angles and especially with clearly visible pixel grids. As the DeltaE values are much too high, the screen has a strong blue tint, which can be largely removed by calibrating. The Gamma value of 2.75 is significantly different from the target of 2.2. After all, contrast (563:1) and black value (0.4 cd/m²) are mid-range. Passive cooling already indicates what we can expect. Our HP 250 G2 houses an extremely frugal, yet weak Intel Pentium N3510 with four physical cores with a fixed clock rate of 2 GHz and 4 GB of DDR3L RAM. The very weak integrated Intel HD Graphics (Bay Trail) is responsible for graphics. 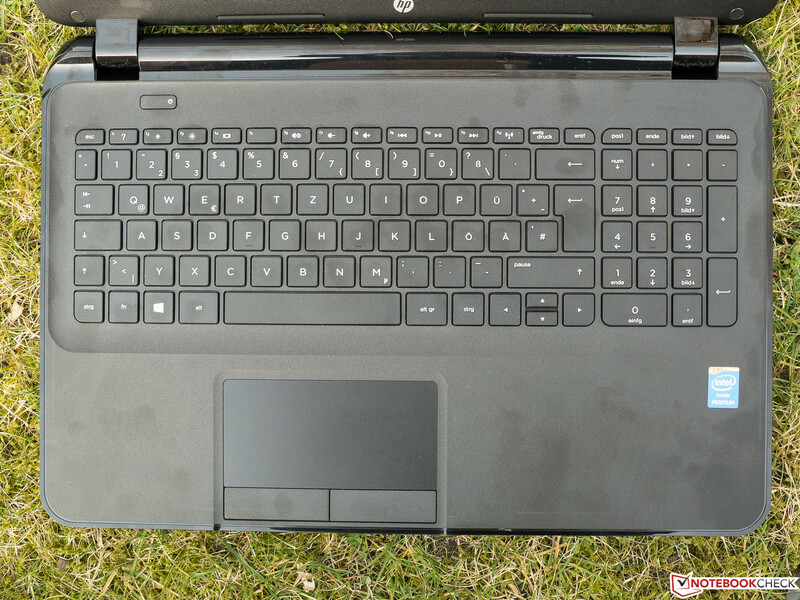 With its entry-level hardware, the HP 250 G2 is suitable for office use and even for multimedia to some extent. Demanding software (like Adobe Photoshop Lightroom) asks too much from the device and makes the device sluggish. The clock rate remains at 2.0 GHz even during longer full load. The temperature does not exceed 70 °C. The CPU with four physical cores (2 GHz, no Hyperthreading) is processed in the latest 22 nm lithography and belongs to Intel's Bay Trail M platform, which is characterized by a particularly high energy efficiency. In the broadest sense, the Pentium N3510 is a successor of the weak Atom CPUs, usually found in netbooks. However, its CPU performance is slightly better than the competing Kabini series from AMD with double the TDP. Compared to other notebooks with the same hardware, the multi-core performance is as expected in Cinebench 11.5. The extremely bad result during single-core load was very surprising. We expected a higher score here. Consequently, the proportion of single and multi-core performance is not reasonable: instead of nearly 1:6, a ratio of about 1:4 would be normal. 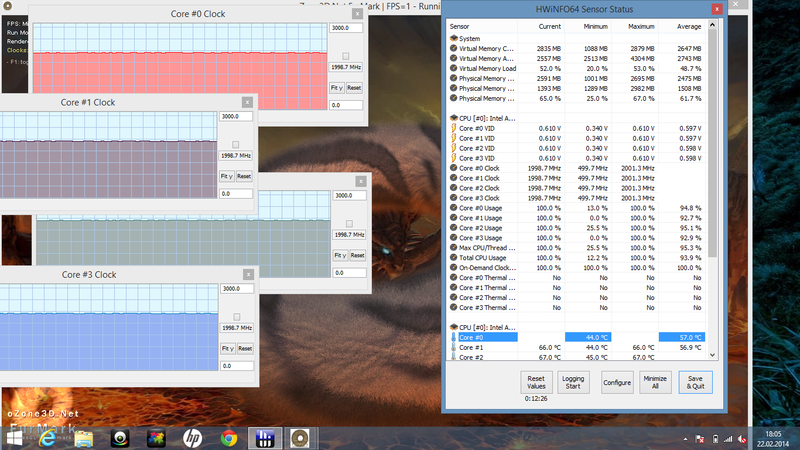 As the screenshot on the right (Prime 95 and FurMark) shows, throttling is not an issue. 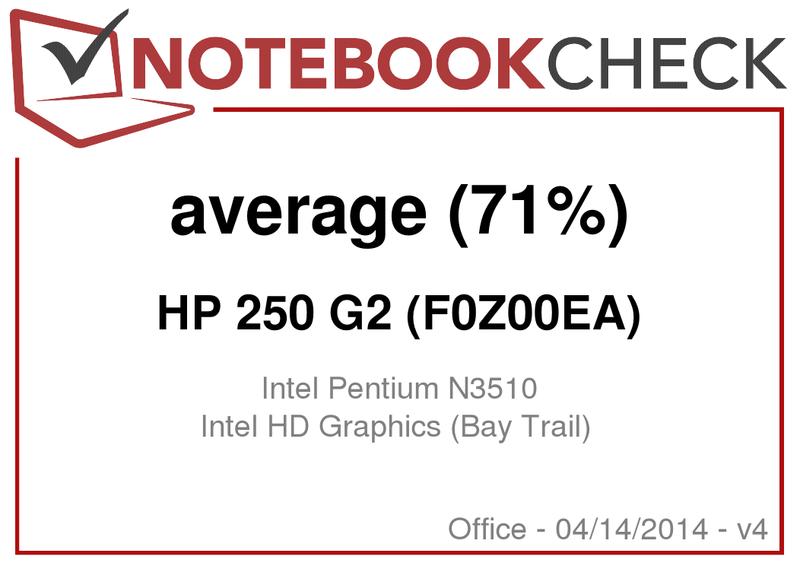 As expected, the Pentium N3510 model performs slightly better than its AMD A4-5000 competitors in PCMark 7. But, the differences can actually be neglected. Again, the performance is as low as expected. The 500 GB hard drive running at 5400 rpm comes from Hitachi. Its write and read rates give a solid performance, but it works up to 46% faster (sequential reading) in other notebooks. 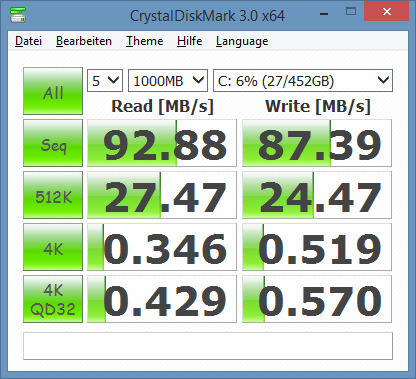 Several notebooks with the same hard drive perform between 15 to 25% better. 3DMark (2013) proves that, depending on the demands, the competing Kabini APU AMD A4-5000 is between 40 to 100% (without physics tests) faster than the Intel HD graphics in our test model. This can be crucial on this low performance level. In terms of gaming performance, the selection of smoothly playable games is very restricted with the A4-5000 and extremely restricted with our Pentium. The graphics performance is normal in comparison with identically or similarly equipped competitors. Older, graphically undemanding titles like World of Warcraft can be played smoothly with the low-performance hardware and this is only possible with the lowest settings. Even the not very demanding graphics of Diablo III are too much to allow fun game play. If your gaming demands are higher than Minesweeper and Solitaire, you should instead consider a device with a Kabini APU, e.g. the A4-5000 from AMD, e.g. with integrated AMD Radeon HD 8330. As already mentioned, the HP 250 G2 features passive cooling; the only noise that is sometimes audible in very quiet environments is the minimal rustling of the hard drive and sometimes the moving heads. If you like it when it is very quiet, you will like this notebook. You can see at first glance that high temperatures are not an issue in the figure below. Even under load, the temperature remains far from critical in areas the hands rest on most of the time. (+) The maximum temperature on the upper side is 38.7 °C / 102 F, compared to the average of 33.9 °C / 93 F, ranging from 21.2 to 62.5 °C for the class Office. Significantly, notebooks that are more expensive sound worse. When listening to most of our test music, the speakers of the HP 250 G2 produced a moderately differentiated, yet mid-tone heavy sound with a touch of dynamics, yet not with much body. If music is bass heavy, the sound tends to get mushy. The overall rating of the speakers is only modest because of annoying volume fluctuations at maximum volume, which is not high anyway. Power consumption is unnecessary if a device is turned off and our HP's 0.1 Watts is very low. 0.4 Watts in standby mode is average among current office notebooks the same size. The power consumption at medium load is also average. Low performance goes with only 19.2 Watts under full load. 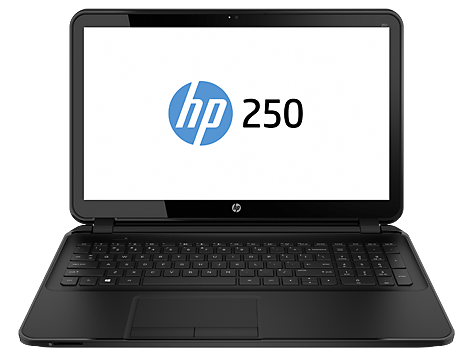 Therefore, the HP 250 G2 belongs to the top among comparable devices here. The power adapter's capacity is sufficient. During our realistic WLAN test, which automatically loads representative web sites in 40-second intervals, the brightness is set to about 150 cd/m² and the energy-saving profile is selected. Our test model achieves a battery life of above 4.5 hours here, which is average among current office notebooks the same size. As already expected, the HP 250 G2 does not stand out from the crowd. Its silent operation makes it special among the competitors. The display is poor, but at least it is matte and not too dark. The acceptable input devices perform slightly better. The sound is all right for this price class. 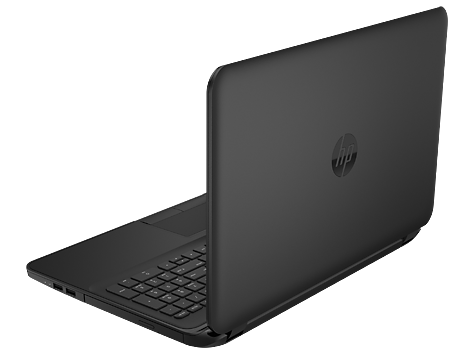 While HP tried to make the laptop look slightly special with the silky-looking matte surface, the device is, unfortunately, sensitive to fingerprints. Subjectively, the performance is okay if you consider the weak hardware: Longer delays occurred rarely during surfing and office applications. In our tests, programs started quickly. The acceptable hard drive might help here too. 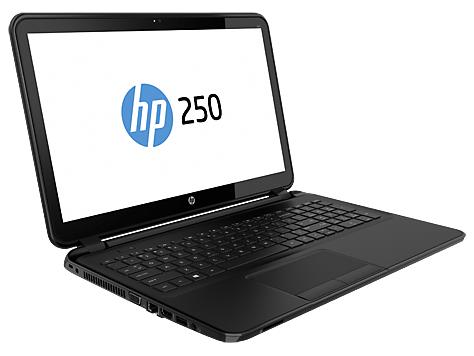 Those who can live with several compromises will get an acceptable office notebook with the HP 250 G2. We think its cheap price is reasonable. As an alternative, it might be worth considering the also very cheap notebooks based on the Kabini platform because of their better graphics performance. However, they are not as frugal as the Pentium in our test model. Apart from the price, the best part of the HP 250 G2 is its nearly silent operation. A maintenance hatch which covers more than the single RAM slot. Mostly, passive cooling goes along with some thermal problems. But this is not true for this cheap device.